A treasure in East Texas. This ranch is a very rare offering of the perfect sized ranch that provides a sanctuary from the outside world without being too large. Its proximity to Dallas will attract those who still have business and affairs to handle in the city while giving a close retreat for friends and family. The elevation changes alone provide picturesque views that can’t be made or bought on another piece of property. 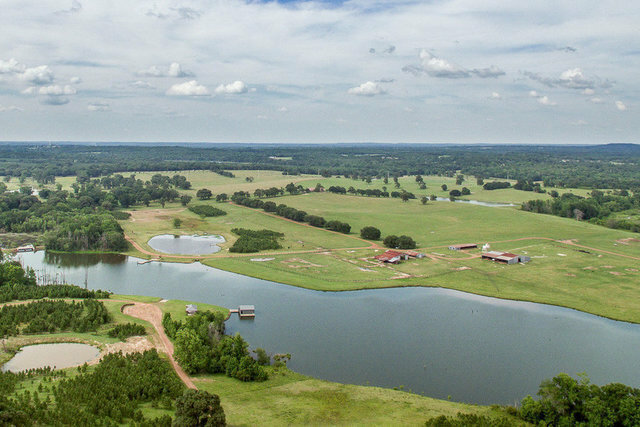 It sits in the heart of East Texas and is a true working cattle ranch. The pastures and landscape have been highly improved ensuring the coastal bermuda is lush each year. Another aspect of this ranch are its high-end recreational and wildlife refuge areas. Deer, fowl, and fish are managed carefully for optimal hunting and viewing. The ranch has served as a nature lover’s paradise for a family with many interests. Owners and guests alike have participated in the day-to-day cattle working on horseback alongside the cattle dogs. Sweeping views of the valley below while overlooking the stunning large lake and surrounding hills are breathtaking -- sure to please the most discerning land buyers.